My Baby Can’t Read. But He’s Already a Book Collector. – my books. my life. My Baby Can’t Read. But He’s Already a Book Collector. So it’s been a week since I posted anything. I apologize. But we moved this weekend so be reassured that while my blog is taking a backseat, THINGS are happening for me behind the scenes. But I do have a quick post for you today. On Saturday, I was given an absolutely lovely baby shower. I could show you pictures of the amazing cake, gorgeous table, or fabulous diaper cake made by my equally fabulous mother-in-law, but I am going to skip right to the thing you all like most: books. My hostesses, knowing we are a family of readers, gave me a surprise. They asked every guest to bring a book or two so baby will start his life with his very own library. Obviously I love this. My dad is coming this Sunday to help me paint and set up the nursery and I can’t wait to see this little library on display. My best friend back home is also having a baby. Her shower invitation included instructions to send a book with an inscription instead of a card. Have you been to showers that had a bookish element? That is amazing!! While we didn’t do anything like that for my sister (it’s expensive to ship to her up North, and anything people gave her at the shower she would have to ship home so she requested people attend to see her and the baby only and bring no gifts), family have allll been sending books, of course 🙂 The baby already has a full bookshelf and she’s only 7 months old 😉 Sounds like you may have just as much luck! What a perfect, perfect baby shower gift! Honestly, when and if we get blessed with a baby someday, I am so asking for this! I love the ‘everyone bring a book’ showers! This is so awesome, and I have never even heard of the idea before! Looking into that basket I see that there is a ton of good stuff, and I am so excited that the little one will be starting life with such a great new library! Hope the move turned out to be stress free and that you are getting settled in your new place. This is wonderful, Michelle! 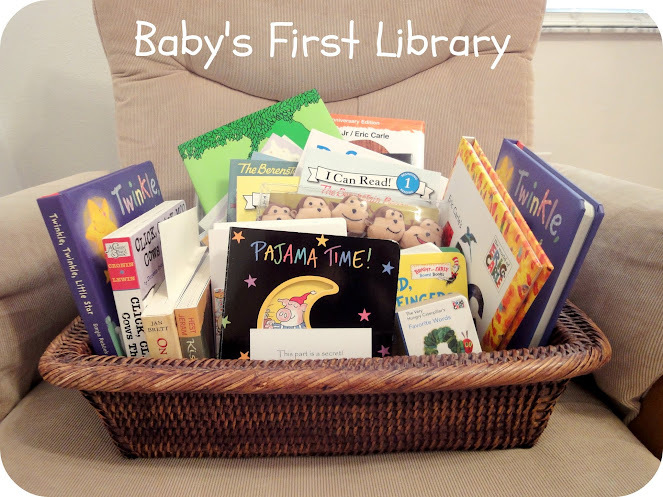 Love the picture of your baby’s first library! How amazing! I wish someone had done this for me at my baby showers. You only need so many baby outfits. Those look like great books too. My kids always loved the Sandra Boynton ones. I love the idea of everyone giving a book, it’s so easy for any of your friends too! Can’t wait to see the nursery progress….exciting times for you. I love the idea for a baby shower! Looks like you got some awesome books too.